Wait for it … until well after the hunt, that is. 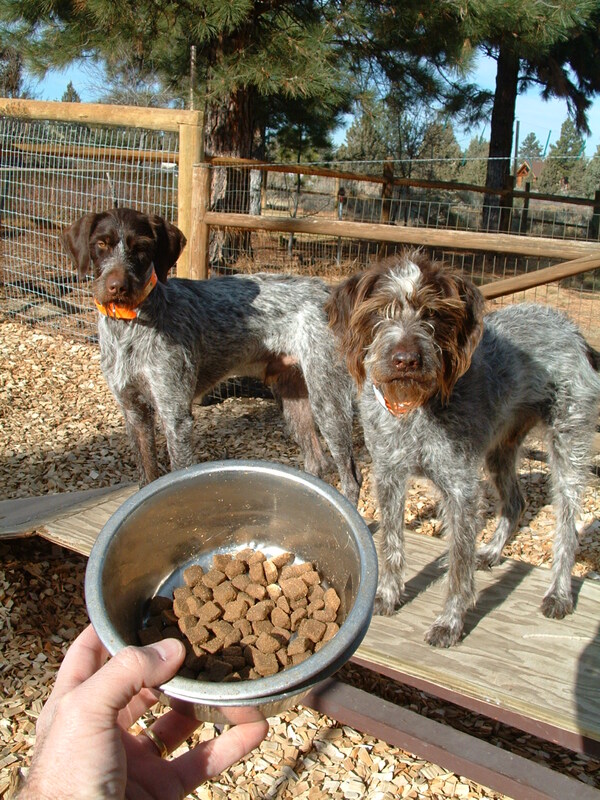 Just as important as what you feed is when you feed your hunting partner. There are simple mechanical reasons not to feed your dog the morning of a hunt. An empty G.I. tract doesn’t hold anything that could rattle around in there. Try this experiment: Take off your sock (representing your dog’s stomach and intestinal track), drop your car keys (ersatz “dog food”) into it. Hold it horizontally, and the dog food will settle in the heel. Then jiggle it, swing it back and forth, whip it around a little like a dog on the hunt would. All that weight will make the sock swing, bounce up and down, possibly even twist. Veterinarians call it gastro volvulus and it is often fatal. Your dog’s athletic performance is another concern. Studies have shown than a dog with food in its gut runs slower, is less agile, and has less stamina than one hunting on an empty stomach. Another good reason: the gut is not using the body’s finite allotment of energy to digest food when it could be fueling active muscles that are chasing birds. No guilt trips here, your dog’s metabolism is unlike yours. Sending your dog into the field without breakfast will have no ill effects. Unless he’s got other health problems, he won’t develop “low blood sugar,” because dogs get their version of instant energy from fat. If you can’t resist giving Gunner something during the hunt, give him a high-fat content snack that won’t fill his belly. You can make your own, or simply offer him some of your salami sandwich (just the meat). There are plenty of commercial versions out there in tubes, droppers and blocks. The key is low volume, high fat to keep the belly as empty as possible. You can’t go wrong offering water frequently – it keeps a dog cool as well as hydrated. Make life simple on both of you by carrying a bota (wine skin) or the modern equivalent. Teach your dog to drink from it just like you, so there is no need to drag a bowl or sacrifice your hat as a substitute.